Organic maple syrup – #1 Medium. This delicious, organic maple syrup is made by Canada’s leading producer of maple syrup. It has a sweet, full-bodied taste, making it ideal instead of sugar in beverages and cooking, as well as on top of pancakes and ice cream. 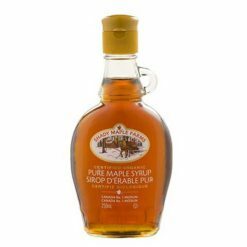 Shady Maple Farms is the premium quality organic brand of Citadelle, the worldEEs largest supplier of 100% pure maple syrup. It is the brand of choice for top chefs around the globe and consumers who seek the best in terms of taste and purity. Citadelle developed a special technology to produce a thicker, richer maple syrup without losing any of its inherently nutritious qualities after surveys revealed consumer demand. The result is maple syrups of exquisite taste and outstanding quality. Cutting-edge techniques are used to prevent oxygen formation during processing, and innovative packaging guarantees a long shelf life. Stringent criteria and continuous monitoring guarantee the constant, unwavering purity of Shady Maple FarmsEE maple syrup. It has impeccable quality and proven nutritional value, making it a delicious, healthy choice.